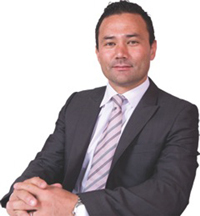 Peter Bell was born in South Korea to a Korean mother and American father, growing up in Kojonup, Western Australia, after he was adopted by an Australian couple. He played football at the highest level for eight years, playing 286 games for the Fremantle Dockers and North Melbourne Kangaroos. Peter was drafted by Fremantle with the club’s first pick in 1995, the Dockers debut year…. Peter Bell was born in South Korea to a Korean mother and American father, growing up in Kojonup, Western Australia, after he was adopted by an Australian couple. He played football at the highest level for eight years, playing 286 games for the Fremantle Dockers and North Melbourne Kangaroos. Peter was drafted by Fremantle with the club’s first pick in 1995, the Dockers debut year. After only managing two senior games in his first year he was delisted but given a lifeline by North Melbourne who picked him up in the pre-season draft. In his first year with the Kangaroos he played in the club’s 1996 premiership and later their 1999 triumph. During his time with North Melbourne he played 123 games including 15 finals. Four times he finished in top three polling of the club’s best and fairest award. He also served in the leadership group alongside Kangaroo greats Wayne Carey and Glenn Archer. While living in Melbourne he continued the law degree that he started at Murdoch University in Perth and featured regularly in the football media. Peter won the club’s best and fairest in 2001 before returning to Perth where he rejoined the Dockers. In 2002 he was a shining light, winning the club’s best and fairest in a poor season for the club. The following year Peter was appointed captain of the club, a position he held for five seasons, and the club made its finals debut. The year was topped off with All-Australian selection. In 2004 Peter won another best and fairest but the club missed the finals and again the following year. Following a poor start, on the back of a club record nine successive wins, the Dockers made the top four for the first time and won the club’s first final. Peter retired in 2008 and subsequently completed his law degree at the University of Western Australia. Peter’s presentation ‘Dealing with Success & Failure’ covers a range of topics including leadership, teamwork, goal setting, perseverance and overcoming obstacles. His presentations are inspiring and entertaining, delivered with anecdotes and a good chunk of humour. Peter has hosted corporate, sporting and government events.